This entry was posted on Tuesday, February 12th, 2019 at 11:58 am. 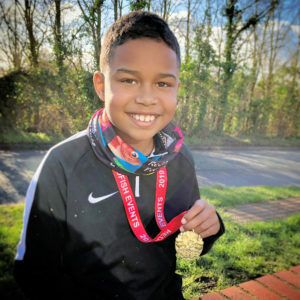 Ten-year-old Lucas Wint, of Westbury, set himself a personal challenge to run the 5K Bowerhill Bomber on the 3rd February, in order to raise funds for the Bath Cancer Unit Support Group. Lucas had never run this distance before, but wanted to raise money in support of his best friend’s nan, who is currently receiving cancer treatment at Bath’s RUH. Unfortunately, the Bowerhill Bomber had to be cancelled due to the weather conditions – but it was going to take more that a deluge of snow to stop Lucas from completing his challenge, especially after so many people had sponsored him! Undeterred by the icy conditions, a family friend took Lucas out on the morning of the 3rd February and they ran their own race around Westbury – covering over 6.5k. But on hearing about Lucas’ determination, the organisers of the Bowerhill Bomber, contacted his mum Frances, and offered to take Lucas around the actual 5k route once the snow and ice cleared. A week after the original race date, Adam Firks of Redfish Events ran the very muddy route with Lucas – thereby enabling him to complete his personal challenge in a very impressive 26.5 minutes. Adam explained that Lucas has been a regular participant in their previous 3k races and it was a very proud moment for Redfish Events when Lucas choose the Bowerhill Bomber as his first 5k distance – in which he would have been the youngest runner. Lucas says he would like to thank both Adam and Tracey of Redfish Events for their support in enabling him to fulfill his wish to complete an official 5k whilst supporting his best friend’s family. He would also like to thank everyone who has sponsored him – to date, more than £675 (plus additional gift aid) has been pledged. If you would like to add to this total, please visit his Virgin Money Giving page at https://uk.virginmoneygiving.com/FrancesWint. A spokesperson from the BCUSG charity said they were “absolutely blown away by this young man’s determination and is very grateful for the incredible amount of money he has raised.” To find out more about the BCUSG charity, please visit www.bcusg.org or follow @BathCancerUnitSupportGroup on Facebook. Picture: Adam Firks of Redfish Events with Lucas Wint.